The planet mars called mangal in Vedic astrology parlance -represents courage, actions,manliness,will-power , compassion, completion in positive sense. In negative sense mars represents in action, aggression, lassitude, delays and fights/quarrels. Mars is a hot planet- and people governed by this are generally action oriented, leadors and more tuned towards action. Also people from fire arms manufacturers, police and army etc are ruled by mars. People with mars dominant in their birth charts/horoscopes are generally aggressive, impulsive and need to take care of the words they sue. They are prone to have a strong body . They also severely resent any kind of criticism. Muscles and heat in body is represented by planet mars. A combination of mars and Saturn could cause deadly wars, fires or other catastrophes. 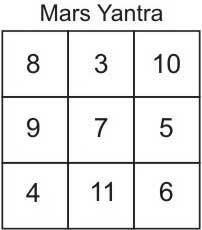 Mars aspects which are significant are- 4th,7th and 8th. Any aspect of mars on the lord of 7th(The house of marriage) or lord to the house of 7th is called mangal dosha. Mangal doshas could be of different degrees and magnitude- if very intense, it harms or hurts the life porter and or the marriage. In India it is compulsory to get a kundli or horoscope evaluated for mangal dosha. Your ascendant or moon sign is aries or Scorpio, mars is the strongest planet in your birth chart or horoscope, you are born on Tuesdays or 9th,18th or 27th of nay month. If you are strong willed, courageous and action oriented then be assured your mars is strong. But if you are aggressive on a trifle, outspoken and fighting mostly- your mars could be afflicted.One could know their exact status by studying your complete birth chart. Coral or blood stone. Stone should be worn only after proper evaluation of your horoscope. Om kum kujaye 108 times. Mr. Akshay Kumar, a well known hero in bollywood is a true expression of positive aspect of mars. He is born on September 9, 1967. He is an action oriented person, and a martial artists-a skill that primarily brought him to the film industry. His action and perseverance(positive mars) lead him to success. Mars is known as mangal in Indian astrology. Mars is considered to be a malefic graham/planet due to its aggressive nature. The planet mars rules the strength and muscles. A strong mars means a person is strong and may be aggressive if ruler ship is of malefic houses. Mars is the army chief. Mars dominated people are not very tall, the color is blood red. Fire is ruled by mars. Mars or mangal is a tamasic graham/planet. About mars . Mars or mangal has blood-red eyes, it is also fickle-minded, liberal, bilious, mostly anger and has got thin waist and a slim physique. Places of fire ruled by mars. Mars has a bitter taste so say if mars is in 2nd house, the person prefers bitter things more. Mars is strong in south. Strong in birth half of the moon. Mars rules bitter tress like the lemon tree. The sun , moon , mars, mercury, Jupiter, venues and Saturn in sequence govern red silken(sun), white silken(moon), red(mars), black silken(mercury), saffron(Jupiter), silken and multi-coloured robes for saturn.Mars rules the summer, the greeshma ritu or season. Mars is a dhatu planet/graham. Mars is strong in Capricorn.